To tackle the worsening air quality within China, various solutions have been devised up. In this section, we will be making policy recommendations that will be highly effective, both meeting criteria and the analysis of the situation present. Burning of coal, oil etc. In conjunction, we also need to address the general public, making them aware of these issues and acknowledging what they have to contribute to us. Figure 1: One of the most prominent causes of air pollution and needs to be addressed in the solutions; the burning of coal. Numbers of studies have shown there is a heavy link between the regional air quality and the coal consumption within the vicinity. There are various ways to tackle the PM 2.5 particles produced, either by upgrading the current energy source or introducing new ones. As expressed by Briefing Dangerous Breathing, capping regional coal consumption would reduce the rapid growth of coal demand and minimise the emissions that area creates as a result; sulphur dioxide, nitrogen oxide and PM 2.5 particles. This is the primary solution, as it reduces the pollutants that are responsible, whilst continued growth in this area may affect policies that do attempt to reduce PM 2.5 particles. In the Action Plan for Air Pollution Prevention and Control, similar means have been expressed, attempting to reduce the reliance on coal to power cities. The only flaw is that these require to cooperation of an area as a whole, with regions requiring the cooperation of all individual cities to abide by this. Furthermore, the lower energy consumption rate needs to be accounted for, which will be answered later. 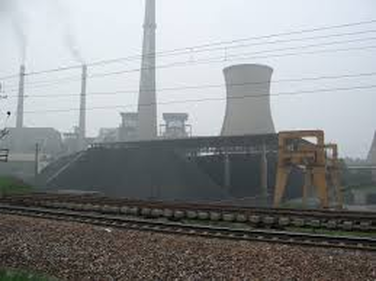 Nitogen oxide is one of the major sources of PM 2.5 particles, which is expended when coal is burnt. To minimise the harm when these are released, power plants may use a nitrogen oxide absorber, which reacts with the gas so that it is removed before it enters the atmosphere. This has been enforced on all power industries, but a majority have been very idle in making the transition, such that it is releasing unnecessary particles. The pricing on this may require some subsidization before it can be fully implemented but it is required. For the past 3 years, the Chinese government has been encouraging the use of both solar and wind energy into the economy. Notably, the subsidies and market access during these times has brought in companies that have suddenly become big players in the energy market. Most notably, the dominance in solar and wind has forced the local German businesses to quit, with little chance against the cheap manufacturing within China. Both these forms of renewable energy have almost zero emissions, thus removing the PM 2.5 particles that are exhibited by coal and the respective air pollution. By 2015, due to the increasing awareness of China's predicament, renewable energy could generate 55% or more of the power generating capacity. Whilst Natural Gas is not as renewable as the other energies, the simple fact that its emissions are clean also make it an enticing prospect to fuel China's growth into the future. The core of China's economy has been stable energy supply, with coal, oil and gas. With the consistent disadvantages being imposed on coal, natural gas has suddenly become a favourable source of energy, especially when the government demands a cut in carbon emissions. Gas has skyrocketed, powering 45% of the industrial sector and the government still no satisfied; it is still attempting to nearly double its gas production in 10 years. Even though it isn't renewable, natural gas has championed the desired low-carbon economy and will continue to be a prominent solution. Secondary in the emissions is the usage of vehicles. With millions of cars travelling around China, the exhaust from these vehicles have been detrimental to the release of PM 2.5 particles and smog. Possible solutions to these issues are as follows. As already expressed in the Action Plan for Air Pollution Prevention and Control, increasing emissions standards will reduce the cars that pollute the streets excessively with their outdated exhaust systems. The development of advanced car technology, notably the European V standard will force those below the emission standard to purchase new vehicles, thus decreasing the PM 2.5 particles released. Furthermore, this will set the preliminary steps to further increase standards. By reducing the ability for new vehicles to be acquired, we are effectively reducing the amount of vehicles that are able to use the roads and pollute the air. The reduction in vehicles in Beijing's action plan will cut 10% of all vehicles by 2020, thus reducing the pollution that can be exhibited. By implementing this in other areas throughout China, a large number of vehicles could be removed off the roads. When you remove a large number of vehicles off the road, there should be a method in which these people can commute effectively. Improving public transport within China would entice more to willingly give up motor vehicles. Notably, fitting the public transport with more advanced technology and improving the service would go a long way towards reducing the air pollution within China, as the energy usage per person is reduced. By implementing these 3 solutions, the impact of motor vehicles could be severely reduced and could eventually lead to the clearing of China's skies. By raising awareness to the general public, we can efficiently get the message across that this is an imminent issue. For action to occur, now and into the future, a large enough base to back these solutions is required and to lobby for political individuals to take action. Furthermore, increasing awareness allows individuals to each take their own actions towards the eventual solution. This awareness can allow the populous to actively take public transport, choose fuel efficient car models or to save electricity. The recent air pollution episode in January 2013 triggered the emergency response that saw the closure of schools and the heavy recommendation to stay indoors. By improving these Emergency Response Plans, we can clearly achieve faster response to these episodes of excessive air pollution. These plans allow minimum harm to come to citizens during these episodes, thus reducing the impact these have on the overall health of the population. This is an effective short term solution that can aid the population, until the reduction in other causes clears the air. 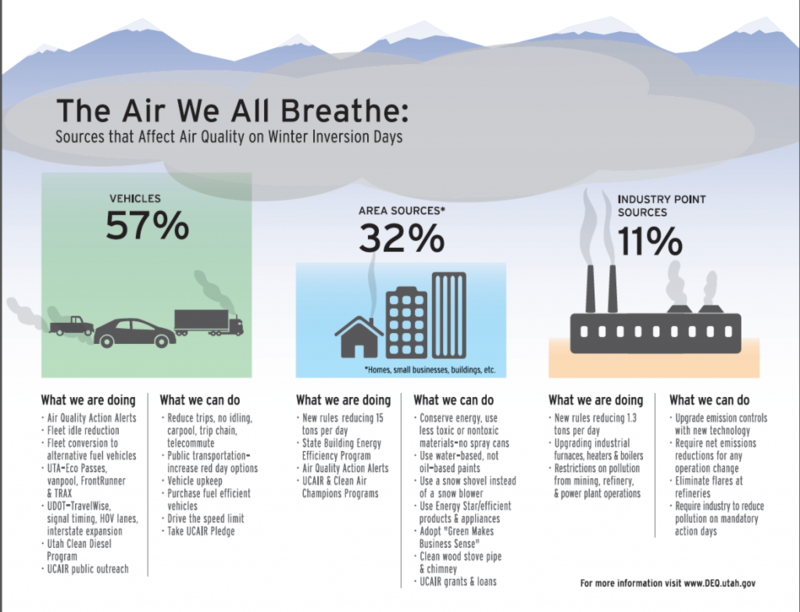 DEQ Utah, (2013), The Air we all breathe. Available at: http://hollyonthehill.com/wp-content/uploads/2013/02/Air-Quality-1024x783.png Last accessed 26 October 14].